It was a HOT Memorial Day weekend in Chicago for Lauren and Henry’s Navy Pier wedding! The heat was not going to stop this amazing wedding party from having a blast! The day started at the Sheraton Grand Hotel where the bridal party got ready. Lauren’s gardeny bo-ho bouquet was so gorgeous, featuring blush roses, white roses, green lisianthus, white wax flower, blush spray roses and greenery! 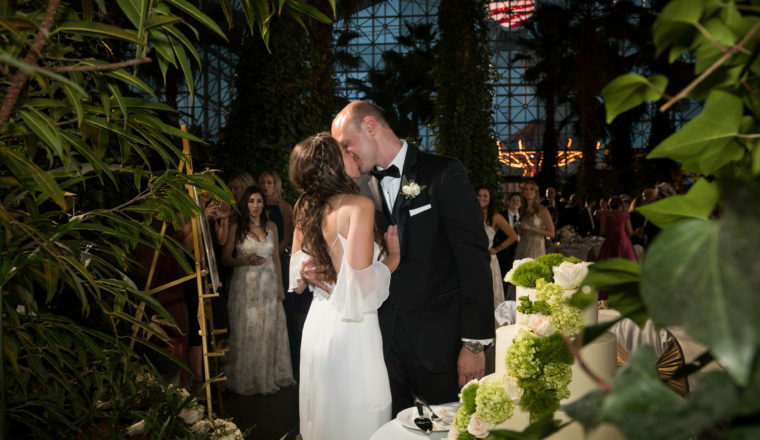 The ceremony and reception were both held at Crystal Gardens at Navy Pier. The chuppah featured arrangements on the top and sides incorporating oriental lilies, white snap dragons, blush roses, blush spray roses and greenery. The reception included a gorgeous arrangement for the sweetheart table as well as three different centerpieces. The first centerpiece was a gold candelabra featuring white hydrangeas, blush roses, white roses, light green lisianthus and blush spray roses. The second centerpiece was a gold compote bowl featuring white hydrangeas, blush roses, light green lisianthus and blush spray roses. The third centerpiece was a trio of water gardens. One of our favorite things (and there were many) from this wedding had to be the cake! The cake was a waterfall of mini green hydrangea, green trick, hypericum, blush roses and green lisianthus! Thank you to Megan Bearder Photography for the images!